After breaking out for 354 rushing yards and 2 touchdowns to open the season, Viking’s rookie running back Dalvin Cook suffered a severe injury in week 4’s loss to the Lions. On Monday, coach Mike Zimmer confirmed that Cook tore his left ACL and will miss the remainder of the season. This is another blow for the Viking’s offense already missing Sam Bradford. Cook should be on track for the beginning of the 2018 season. In another shocking turn of events, surprise starting rookie running back Chris Carson suffered a severe lower body injury to his ankle and leg in Seattle’s Sunday victory. 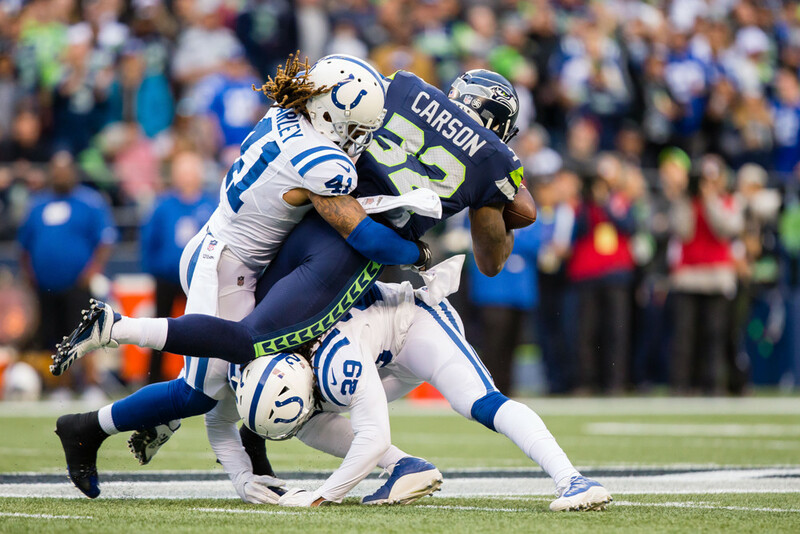 The Seahawks reported Tuesday morning that Carson has a successful surgery to repair his broken leg and injured ankle. The Seahawks had previously placed Carson on IR on Monday and he is likely to miss the remainder of the season. Atlanta’s superstar wide receiver Julio Jones suffered a hip flexor injury that forced him from week 4’s surprising loss to Buffalo. Despite his inability to return to the game, Adam Schefter reported that Jones is unlikely to miss any time with Atlanta on their bye week. Head coach Dan Quinn also confirmed these reports. It appears that Julio Jones’ owner can breathe a sigh of relief. In week 4’s loss to the Houston Texans, Marcus Mariota left with a hamstring injury. Although he did not return to the game, coach Mike Mularkey called Mariota day-to-day. He also compared Mariota’s hamstring injury to DeMarco Murray’s, which he has been able to play through since training camp. At this point, Mariota is legitimately questionable to play in week 5. Although he does not need to practice to play, getting in limited work would be a good sign for his availability. In a flashback to 2016, Derek Carr suffered an injury in the same week as Mariota. However, Carr’s appears to be a bit more serious. Coach Jack Del Rio said Carr has a transverse process fracture in his back and it will cost him between 2-6 weeks. For now, Carr should be considered out for weeks 5 and 6 and highly questionable for the subsequent weeks. Ty Montgomery was forced from Thursday’s game against the Bears on the first drive with a rib injury. Early Tuesday morning Adam Schefter reported that Montgomery is dealing with multiple fractured ribs. Montgomery said himself that he is feeling a lot better, but beat reporter Rob Demovsky noted that it might be a stretch for Montgomery to play in week 5. His availability could come down to a game time decision, but he appears to be on the wrong side of questionable. After having his status downgraded midweek, Michael Crabtree missed last week’s game with a bruised lung. The timetable for an injury like this is highly variable and Crabtree should be considered week-to-week for the time being. While there is a chance he suits up for week 5, he is questionable at the very best. It is more likely that the Raiders play it cautious with their stud receiver and he misses at least a week. After a horrifying hit in Thursday’s game, receiver Davante Adams was diagnosed with a concussion. Ian Rapoport reported that Adams had an MRI on his neck, but it came back clean. Now, Adams enters concussion protocol. According to Adam Schefter there is a chance Adams could play this week, but for now he should be considered week-to-week. Practice reps will be the first sign Adams is trending towards returning. After multiple appearances in this column, Andrew Luck finally has a positive report. Colt’s General Manager Chris Ballard announced that Luck will begin practicing on a limited basis this week. After enduring offseason surgery to his throwing shoulder, Luck’s recovery has remained a mystery to start the year. While practicing is a step in the right direction, Luck should remain week-to-week as the Colts ease him back into action. Along with Julio Jones, the Atlanta Falcons are dealing with an injury to their number 2 wide receiver Mohamed Sanu. Sanu suffered a hamstring injury in the game and failed to return. Vaughn McClure of ESPN reported that Sanu is expected to miss 2-3 weeks with the injury. However, with the Falcons on bye this week, it is possible that Sanu only misses one game. For now, consider him week-to-week.